Parasara in his Brihat Parasara Hora Sastra, Chapter 34, Verse 16, describes the basic effects of the Nodes. He states that Rahu and Ketu predominantly reflect results as due to their conjunction with a sign-lord or as due to the sign they occupy. This is because they are Chaya Grahas or shadowy planets. By definition, a shadow reflects the reality of another, although it is not a perfect duplication. And a shadow still has its own existence, even though it mimics another. This reflective nature of the Nodes, besides being outlined by Parasara, is corroborated in the Puranas. As the narration goes, the demigods retired to the assembly hall of Indra to partake of the nectar of immortality. This was done after churning the Mandara mountain wherefrom the nectar came. At that time, the Daitya Rahu disguised himself as one of the demigods and had a sip of the nectar. 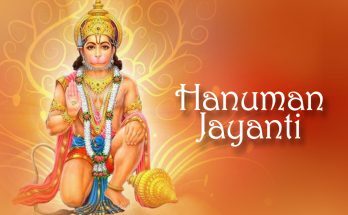 He was discovered by the Sun and the Moon who reported this to Vishnu. And Vishnu severed Rahu’s head by which act the axis was formed. Rahu was later awarded the red-faced head of a serpent by Vishnu. What one is interested in is the fact that, being in the assembly hall of the Gods, Rahu became like one of them. In other words, he reflected his surroundings. 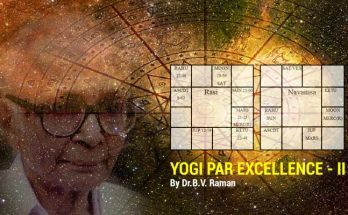 In predictive astrology also, the Rahu-Ketu axis reflects the influence of the sign-lord, the planetary association and any aspects that he may receive. 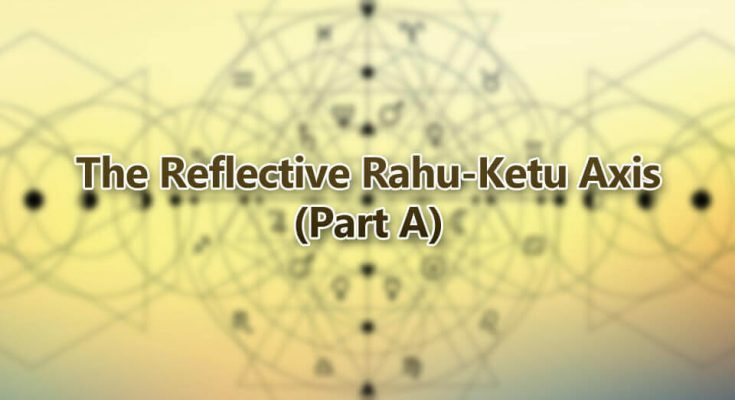 But Rahu and Ketu also have their own results to pass on independent of their reflective nature. Do you have Kuja Dosha? Click Here to know Kuja Dosha in your chart ! This is all in keeping with the above-cited verse of Parasara because the Rishi simply states that the Rahu-Ketu axis has a “predominantly” or mostly reflective nature. The Rishi does not state that the axis is an absolute chameleon or an absolutely transparent medium. The conundrum has to do with how much of which. In other words, various factors complicate interpretation. The question becomes, which is the most indicative? 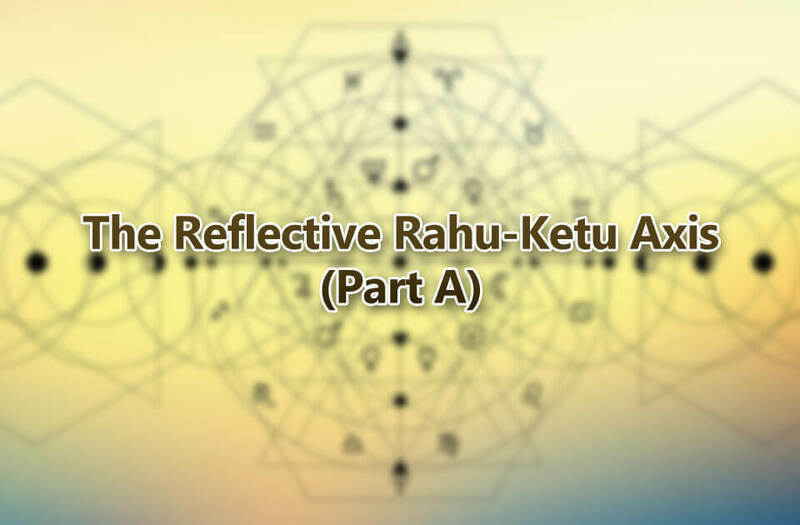 It is the basic premise of this essay that Rahu-Ketu will primarily reflect the results of their sign-lord in preference to the planets that they associate with; that they will reflect the indications of their sign-lord in preference to those of any aspects that they receive; and that the Rahu-Ketu axis gives its own results in terms of house position and the nature of their placement in both sign and Nakshatra. 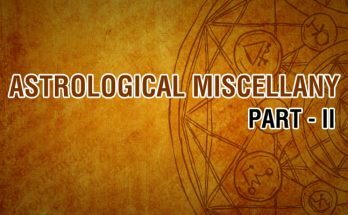 After sign and house position, planetary associations and aspects can be factors, too. Chart A: Born August 4, 1956 at 6h 31m DT at Washington, DC. Chart B: Born July 10, 1951. 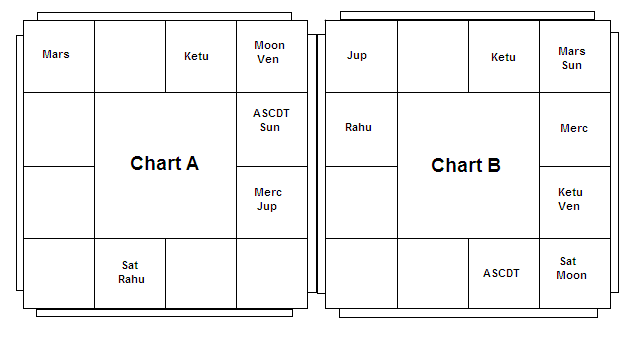 Chart A illustrates this very important point that Rahu will reflect the results of his sign-lord in preference to the results of planetary associations or aspects. As soon as Saturn Dasa began, the education of this native was interrupted prematurely. This only makes sense because, Saturn as a planet of darkness and as a bad lord aspects the Vidyakaraka and Gnanakaraka, Jupiter and Mercury, respectively. However, in Mars Bhukti of Saturn, the native went back to school as a full-time college student. This is understandable because, Yogakaraka Mars aspects the lord of the 4th and the 4th itself, the 4th being the house of formal education. What is even more interesting is the fact that the native spent the entire Rahu Bhukti in a business school with elite accreditation while maintaining a very nice grade point average!